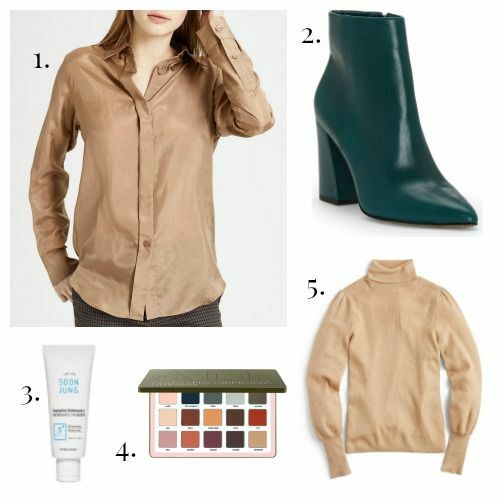 This camel-colored silk shirt feels like fall, but in a crisp, elegant way that will fit in at a business-professional office or for after-work cocktails. And, you can’t get much more classic than a Theory button-down, right? It’s a justifiable investment piece. It so easy to fall into a sea of neutrals for fall. An accessory in a gorgeous blue-green shade is just what warm-toned neutrals need to keep things interesting. Like these affordable booties. The most comfortable pair of shoes I own are from this label, so I’m feeling good about these boots also being super easy to wear. About two days into a recent week-long visit to Hong Kong I realized the only night cream I packed was Sunday Riley Luna Night Oil, and my jet-lagged, over-heated skin was not having the retinol. Luckily there was an outpost of Korean beauty emporium Etude House right downstairs. This sensitive skin sleeping pack is just what I needed. My skin was transformed overnight – redness gone, dry patches obliterated, moisture restored. It’s a near dupe for SkinCeuticals Epidermal Repair, in my opinion, but at about a quarter of the cost. It's available in the US via Soko Glam. This is the first all-matte palette from cult beauty line Natasha Denona, and it was worth the wait. The colors range from workday neutrals to night out brights, all with that signature zero fallout formula and rich pigmentation. The top row is muted cool grey tones, the middle row is occupied by warmer shades, and the bottom row is full of special occasion reddish tones that are so popular right now. The shades are arranged so that applying the colors horizontally creates monochromatic looks, while applying them vertically yields perfectly-matched polychromatic looks. This kind of attention to detail and dedication to excellent pigmentation is why Natasha Denona palettes command such insane prices. This feminine take on your standard fall turtleneck will look so chic with jeans and boots for fall weekend adventures. It’s available in five colors, all at this sale price, but I’m partial to the heather camel color for its wear-with-anything neutral appeal.